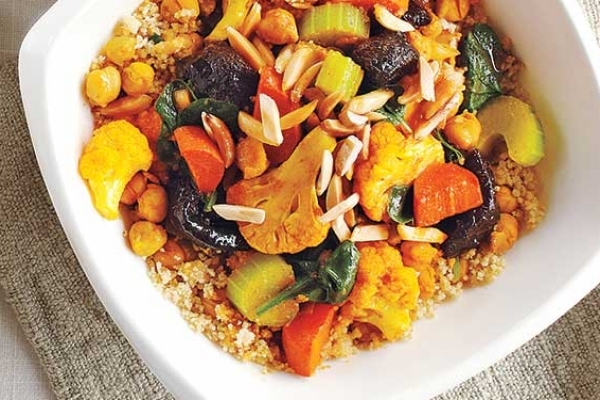 This vegetable and chickpea couscous is delicious and nutritious. Chickpeas are high in fibre and iron, and the prunes add a hint of natural sweetness, which makes this all-in-one dish feel indulgent. Additionally, leftovers make a great portable lunch or side dish when you’re tight for time but need something satisfying and good for you. In Dutch oven or large heavy saucepan, heat oil over medium heat; cook garlic and ginger, stirring for approximately about 1 minute. Add onion, coriander, turmeric and cinnamon; cook, stirring often, until onion is softened, about 5 minutes. Stir in tomato paste; cook for 1 minute.